Claims of police misconduct during a pro-hunting demonstration are being investigated by the Independent Police Complaints Commission. Following allegations made to the media, official complaints had now been made, said the IPPC. Police have released 16 hunt supporters arrested after Wednesday's violent clashes outside Parliament. Brett Parsons, a labourer, has been charged with threatening behaviour and obstructing the highway. The 31 year-old man from Glastonbury, Somerset, will appear before Tower Bridge Magistrates Court on 29 September. The others who were arrested - 15 men and one woman - were either released on bail, released without charge or issued with an on-the-spot fixed penalty notice. A total of 24 members of the public and three police officers are said to have been hurt during the protest. Thousands of fox hunting supporters descended on London in an attempt to dissuade MPs from backing a ban. The arrested demonstrators are being questioned at a south London police station. On Thursday the IPCC said the inquiry into allegations against the police would be overseen by its deputy chair John Wadham. IPCC chairman Nick Hardwick said: "Allegations were made to the media that members of the public had been assaulted. Official complaints have also now been made. "Both the protesters and police officers can have confidence that our investigation will be an impartial, timely and proportionate search for the truth." The IPCC inquiry will not look at police operational decisions nor the breach of security in the House of Commons chamber. A further eight people are in custody after five protesters burst into the Commons chamber while MPs debated the Bill on Wednesday. Those held are suspected of offences including violent disorder, breach of the peace, affray and using threatening words or behaviour. MPs went on to back a ban on hunting in England and Wales by 339 to 155 votes. Organisers said that 20,000 protesters had gathered in Parliament Square while the police estimated the figure at between 8,000 and 10,000. The arrests came after fireworks, plastic bottles and placards were thrown at uniformed officers blocking entry to the Houses of Parliament. Scotland Yard said a small section of the crowd had tried to break through the police cordon but it was "in the main...a peaceful demonstration". But some protesters accused the police of being heavy-handed as they used batons to control the crowds. 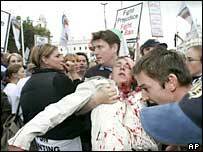 Thomas Brown, a 34-year-old steel erector from Leeds, was left bleeding from the head and neck after the rally. Thomas Fillery, 19, from Buckinghamshire, was knocked unconscious as riot police ran through the crowd, the teenager's friends claimed. And Simon Kenney, a professional huntsman from Durham, also with a head wound, said: "I just want to tell Tony Blair there will be much more trouble like this if they ban hunting." Tony Blair's official spokesman said the prime minister recognised there were strong feelings on all sides of the debate. A Scotland Yard spokesman defended police against allegations they were heavy-handed. "They are made at every demonstration we police. We try to police demonstrations to the best of our ability to keep them peaceful and protect the people involved." A Countryside Alliance spokeswoman said the rally involved "20,000 law-abiding protesters" but condemned the Commons intruders. "The anger among hunters is universal"